The brighter half of the ring imaged by the Event Horizon Telescope. Today, scientists from the Event Horizon Telescope released a picture that will go down in scientific history: the first-ever image of a black hole. But there’s more to science than pretty pictures. Alongside the release, scientists dropped six papers documenting how they created the image and what they’ve already learned about the black hole at the center of M87, a galaxy 55 million light-years away. “This is just the beginning,” Avery Broderick, physicist at the Perimeter Institute and the University of Waterloo said during a National Science Foundation press conference. Researchers are anticipating doing “amazing science” by “studying this image closely and repeating this story,” he said. Black holes are places in space so dense, with such immense gravity, that beyond a certain boundary called the “event horizon,” light cannot escape. Using a technique called very long baseline interferometry, eight telescopes around the world were able to collect data from the black hole at the center of the galaxy M87 back in 2017. Researchers combined radio-wave data from each telescope, creating the image. While the final image is not a photograph and required significant data analysis and modeling to create, several independent techniques were used to process the data, and the shadow always remained in the final images, according to one of the papers. Most importantly, this image once again proves that the main theory that physicists use to explain the force of gravity, the theory of general relativity, is correct. Yale astrophysicist Priyamvada Natarajan told Gizmodo in an email that the picture also offers the strongest evidence yet that what we’ve long thought about galaxies is true—that they contain supermassive black holes at their centers that contain points-of-no-return for light, called event horizons. In short, they’re not just big dense balls, but something scarier. The first image of a black hole. This alone is a huge deal. Despite their chaos, general relativity says that a black hole’s behavior can be predicted based on just three properties: its mass, spin, and electric charge. Much smaller black holes seem follow these rules, as per observations from the LIGO and Virgo gravitational wave detectors, which measure disturbances in spacetime from black holes colliding. But perhaps there’s something we weren’t seeing, some effect that only comes about in larger black holes, and maybe these potential differences could help describe some mysteries of the Universe, like dark matter. But these first results from the Event Horizon Telescope suggest that both big and small black holes obey the same rules. “Just seeing that [M87's black hole] looks like a black hole at billions of times the mass of the Sun, and LIGO’s black holes look like black holes at a few tens of times the mass of the Sun, is already constraining potential modifications to gravity,” Maya Fishbach, graduate student in the University of Chicago department of astronomy and astrophysics, told Gizmodo. What she means is that those hoping to use potential new effects caused by differences in black hole size to solve mysteries like dark matter will need to look elsewhere for answers. Creating the image also taught us the specifics of the black hole itself. 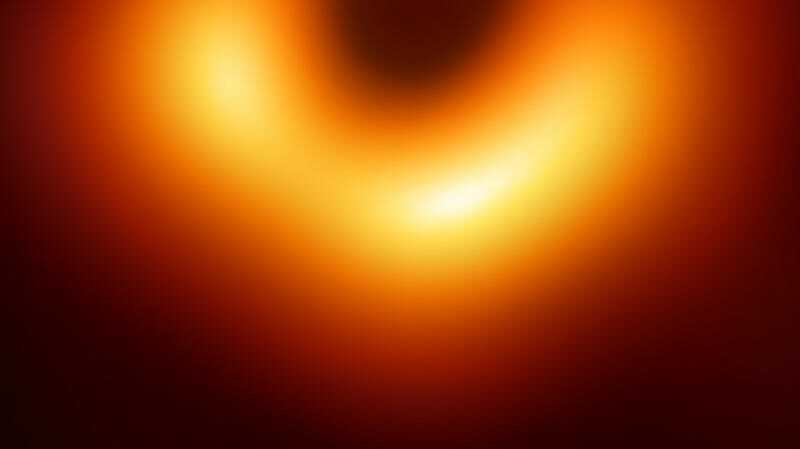 The image doesn’t show the black hole’s event horizon, but a shadow cast by the light around it due to the unstable orbits of photons around the central object. Still, scientists know that the shadow is around five times the Schwarzschild radius, or the size of the event horizon. That’s enough to infer some of the black hole’s properties—researchers calculated its mass, for example, at 6.5 billion times the mass of the Sun. The galaxy M87 and its jet of matter. Another result comes not from the shadow itself, but from the ring of radiation surrounding it. You might notice that it’s asymmetric —it seems to glow stronger on the bottom part of the image than on the top. Past observations of galaxy M87 demonstrate that it’s launching a high-energy jet of matter from its center, and physicists have hypothesized that the jet could be powered by energy associated with the black hole spinning. The asymmetry in the glow provides evidence that the black hole is indeed spinning, which could be powering the jet. The rest of the shape would be due to gravitational lensing—the black hole warping light from the stuff behind it, according to the paper published in The Astrophysical Journal Letters. But they haven’t actually observed the jet yet, Kazunori Akiyama, postdoctoral fellow at the MIT Haystack Observatory leading the EHT imaging group, explained to Gizmodo by phone. And that’s an important area to study, since it could explain how the galaxy M87 evolves more generally—but they don’t yet have the image sensitivity to see the jet itself, nor the jet-forming region. More telescopes will join the effort, and hopefully we’ll also soon see an image of Sagittarius A*, the black hole at the center of our own galaxy. Imaging that black hole has proven more difficult, as it’s much smaller and there’s more motion around it. Today, we’ve got an incredible picture. And soon we’ll get a whole lot more incredible science to ponder over.